In addition to proclaiming praise to God, the book of Psalms in the Bible also provides comfort to many facing affliction. The Psalms offer hope in the midst of turmoil and point us to God for deliverance from the world’s oppression. David writes many of the psalms recorded for us in the Bible, including all five of today’s chapters. He ends chapter 60 with a subtle two-point conclusion that’s easy to miss if we’re not careful. First, David says that when we walk with God, we will realize success. The implication is that without God, victory is not likely. The Bible is full of stories that back this up: with God the impossible happens; without God even seemingly sure things falter. 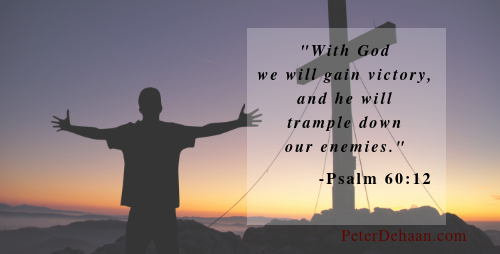 Next David writes that God will punish our enemies. This suggests we shouldn’t seek revenge, but instead we should turn retaliation over to God. He will deal with those who oppose us. David likely recalls this, as well as the many other times God gave him victory and handled his vindication, when he wrote: “With God we will gain the victory, and he will trample down our enemies,” Psalm 60:12. How has God given you victory in a difficult situation? Is it hard to wait on God to deal with those who attack you?